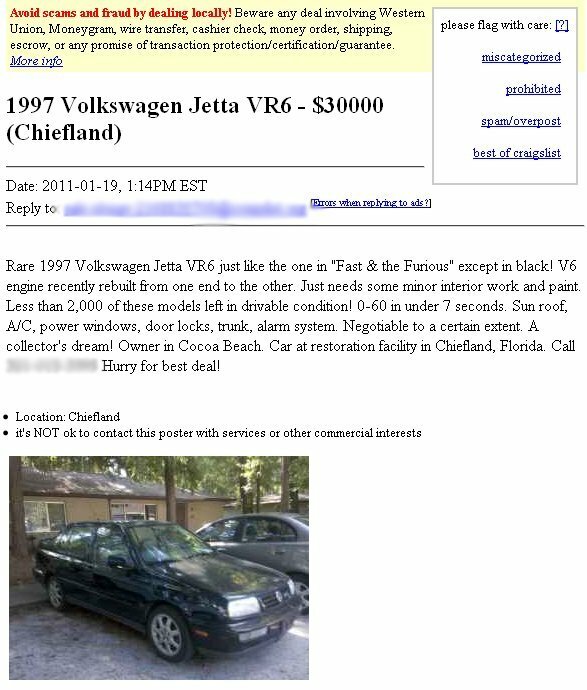 What you see above is a craigslist.org ad for a 1997 Jetta VR6, meticulously restored (well, mostly). As the ad states, it’ll do 0-60 in under seven seconds, it’s fully loaded, and it’s a Florida car. And it could be yours for P-Diddy’s pocket lint–just $30,000.00 U.S.
It’s no great revelation that the World Wide Web is an indispensable resource for car shoppers, but sometimes you come across an example of somebody who has failed in every possible way to properly utilize it. When that individual also happens to be the founder, editor and publisher of a multi-platform activist newsletter who holds multiple graduate degrees (including a M.A. in Journalism), well, you have a spectacle in the making. What follows is a step-by-step breakdown of how Stephanie Donald of LGBT-Today went about thoroughly embarrassing herself. Lesson I: Research, Research, Research. Mrs. Donald failed to complete this particular assignment. If she had, she would have discovered rather quickly that the $22,000 quote for her Jetta’s “restoration” will probably go down as one of the greatest automotive rip-offs in history. Indeed, she would have found that figure suspicious if perhaps she had first bothered to research the initial valuation supposedly given by a professional appraiser in Florida. Extra credit was available for this assignment for students who utilized multiple resources and demonstrated an ability to avoid falling victim to confirmation bias–a phenomenon that an individual with a Master’s Degree in Psychology should be very familiar with, in which the researcher disregards all information contrary to his or her existing beliefs. Extra credit awarded: 0. The student demonstrated adequate classified advertising techniques. The ad was short, descriptive and informative. However, there was no documentation of the supposed $22,000 in recent work performed outside of a reference to the engine being rebuilt “from one end to the other.” No link included to externally-hosted pictures or mention of maintenance records. Lesson III: Responding to Low-ballers. Mrs. Donald’s initial responses were acceptable, but as time progressed and potential buyers began to realize that she was actually serious about her asking price, she started losing her cool as it became clear that the increasingly outrageous “bids” were nothing but jokes from members of the largest English-language Volkswagen community on the Web–VWVortex.com. In a matter of hours, vortex members concocted wild background stories for their progressively larger offers. The student failed to understand the intent of their correspondence until it was pointed out to her by a third party. This assignment was a prerequisite for Lesson IV. Lesson IV: Have Thick Skin. Lesson V (Final Project): The Internet Is Serious Business. Kidding aside, what we’ve witnessed here over the past two days is not member of a protected class being discriminated against. This is a person who is deeply embarrassed over a humiliating set of circumstances that befell her of her own volition. Lashing out in this situation is normal, if unprofessional and unbecoming. Mrs. Donald, you’ve been fooled twice–once by your mechanic and once by members of the Volkswagen community. Yes, members of the community may act juvenile. They may even be hurtful, but nobody said or did anything publicly that constituted a hate crime. Still others have tried to be helpful, and as you refuse to acknowledge the reality of your situation, it’s hard to feel any sympathy. It’s not our fault you made the decisions that led you here, and while it’s natural for you to desire to lash out, is that really the mature response? As tired as the cliché may be, you’ve been fooled twice, Mrs. Donald.